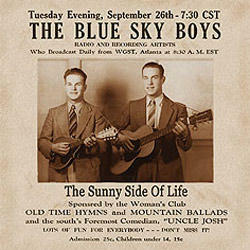 (5-CD box set with hardcover book) Old time music fans have asked Bear Family repeatedly for the Blue Sky Boys. Now, painstakingly transferred from original masters, Bear Family presents all of their RCA recordings. The Blue Sky Boys were the most important early brother duet, and they influenced the Louvin Brothers (who recorded several of their songs including "The Knoxville Girl"), Emmylou Harris (who recorded another Blue Sky Boys classic, "The Sweetest Gift"), the Everly Brothers (who adapted the Blue Sky Boys’ arrangement of "I’m Just Here To Get My Baby Out Of Jail," "Kentucky," and others). Even Johnny Cash recorded a Blue Sky Boys song, "Mary Of The Wild Moor," on his recent American CD.